The piano-led trio is a staple of jazz – has been since the beginning. However, the format can, at times, seem trite – even boring. The challenge for a contemporary pianist is to be different. 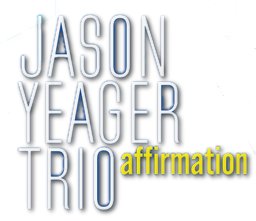 Original songs help make Jason Yeager Trio’s Affirmation (Inner Circle Music, 2014) distinct. Adding a few guests here and there also spoils any chance of monotony. 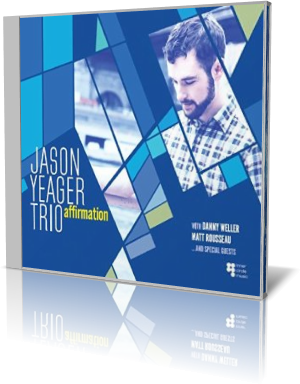 With pianist Yeager are bassist Danny Weller and drummer Matt Rousseau. Three guests appear on selected tracks. The trio is joined by tenor saxophonist Noah Preminger for “Smiled First.” It’s like a hybrid between ambient jazz and something more intense, accented by Rousseau’s rim shots. Preminger’s play is charming and soothing. Yeager and Weller play softly underneath. When Yeager steps out front, he does so with an elegance matched only by the overall beauty of this piece. One of two covers in the set is Lennon and McCartney’s “Julia.” Aubrey Johnson sings lead on this track and one other. Her voice is like a flute with words. The mood is perfect for slow dancing. Preminger and trumpeter Jean Caze are featured on the intense “Keep the Fire.” It starts with a tranquil, but up-tempo solo piano. It builds in increments. Then the other musicians come in, trumpet and sax first blending on the lead. Then the horns play overlapping phrases before another pass at what serves for a brief melody. Then Caze takes point with a flare that at times sounds like Randy Brecker or Freddie Hubbard. Preminger takes the tenor through some blistering paces, dives to the depths of his instrument’s range. Then trumpet and sax engage in a furious passage, two simultaneous solos that warp into a harmonious melody. One can almost swear it’s a full horn section. Affirmation is Yeager’s second recording as a leader. He composed 10 of the 12 tracks. The songs were polished in rehearsals and on the bandstand before the trio went to the studio. During much of that time, the core trio shared an apartment in Brooklyn. Yeager, 27 at the time of this release, has personal and professional ties to the New England area, where he was born. He teaches at Boston’s Berklee College of Music, where he is one of the youngest faculty members. He graduated from a double-degree program at Tufts University and New England Conservatory, where he studied international relations and jazz performance.